I’ve always been confused about steelhead…is it a trout or a salmon? Some people call it steelhead rainbow trout and others call its steelhead Salmon. I asked the fish guy at the grocery store and he said that steelhead thinks its a salmon…it lives in the sea and goes back to the river to spawn. But unlike a salmon, a steelhead goes back to the sea after spawning (instead of dying like a salmon does). I was curious to see if it tasted like a trout or a salmon, so I bought a couple of pounds of a filet. the flesh definitely looked like a salmon, though it was a lighter pink than salmon found in the Pacific Northwest. I mixed up a marinade of honey, wheat-free tamari, sesame oil, and crushed garlic. After removing the pin bones from the filet, I placed the fish skin-side down on a large piece of foil. Bringing up all sides of the foil, I poured half the marinade over fish, then closed up the foil on all sides. While the fish was baking, I put the reserved marinade in a pot and allowed it to cook down and get syrupy. When the fish was done baking, I removed it from the oven., put it on a plate, and spooned on the glaze. While I’m not a big fan of steelhead or salmon (unless the salmon is in a mousse, smoked or sushi), you might enjoy this recipe. My husband really liked it, but I’d rather eat fish I grew up with (perch or catfish). 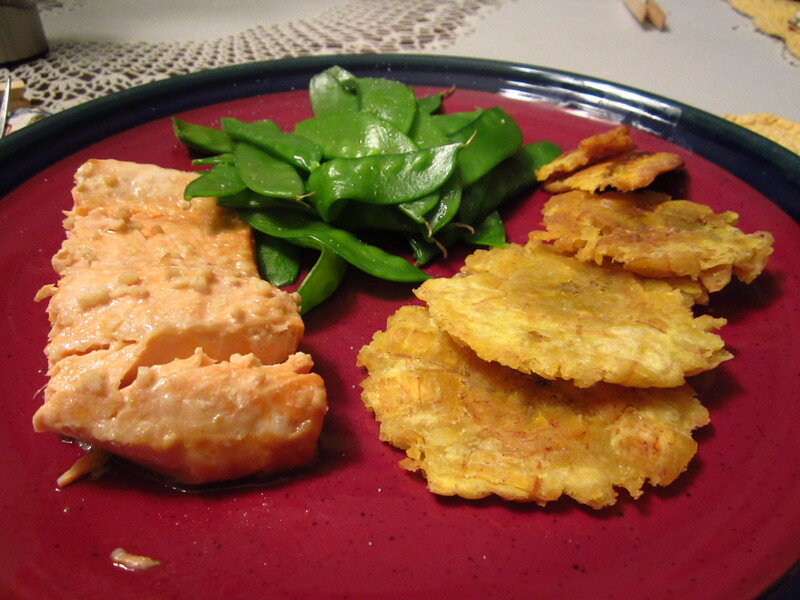 I did, however, love the plantains I served with the fish. You can learn how to cook the plantains at this video. Pull out the pin bones from the filet. Place filet, skin-side down, on a large piece of foil and on top of a baking sheet. Tent the foil and pour half the marinade over the fish. Seal up foil and back for 10 minutes, plus 10 additional minutes for each inch of thickness. While fish is baking, add reserved marinade to a sauce pan. Bring to a boil, then reduce heat. Cook until marinade is about halved and gets thicker. Spoon glaze over fish and serve.